"To do this right, you'll have to commit nothing less than high treason." 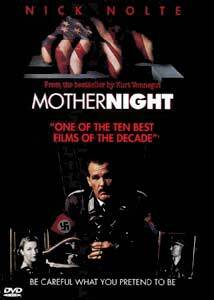 I have to say that I didn't think much of Nick Nolte as an actor, until I watched Mother Night in quick succession after Simpatico, which also starred Nolte. His portrayal of Vinnie Webb in that film is so different from his role as Howard W. Campbell, Jr. in this that film it hardly seems to be the same actor. He has accordingly gone way up in my estimation. Nolte here does a superb turn as Campbell, an American playwright in Germany during the thirties, who is recruited by U.S. Major Frank Wirtanen to act as a secret agent on behalf of the Allies. Campbell is assigned to use his theater position to ingratiate himself with the Nazis, and maneuver into a position where he makes radio addresses extolling the Nazis and excoriating the Jews, but with coded messages buried deep within. The film tracks Campbell, having been arrested in the 1960's by the Israelis, writing his memoirs and attempting to make some sense out of what looks to all like his treasonable conduct. Nolte is at his best in the excerpts from the radio programs, starting out smooth and seductive, and eventually growing into a barely controlled rant, which suddenly halts and returns to the smooth voice of "Howard W. Campbell, the last free American." Mother Night is based on the novel of the same title by Kurt Vonnegut, Jr., and does an admirable job of translating the book to celluloid. Vonnegut's trademark black humor is in evidence throughout, as is the deeper and more serious examination of what makes people do things like the Germans did during World War II. At the root is the central theme, Be careful what you pretend to be. Under the guise of doing one's duty, you may become a monster without meaning to do so. This is set against what Hannah Arendt termed the banality of evil, here personified by the voice of Campbell's overhead fellow prisoner, Adolf Eichmann (amusingly portrayed by Henry Gibson). Director Keith Gordon uses the interesting twist of filming the modern sequences in a crisp black and white, while making the 1930's sequences awash with color and a warm glow, as if Campbell is remembering these times as the best and most beautiful parts of his life. Added to the mix is Sheryl Lee (best known as the dead Laura Palmer on Twin Peaks), who turns in a creditable performance as Campbell's German wife, Helga. She manages a believable German accent, and displays a wide range of emotion that nicely plays off against the cool exterior of Campbell. Kirsten Dunst makes a big impression with the tiny role of Helga' little sister, Resi, a young girl brought to nihilism by the disasters of war: "Nothing means anything. Go ahead and kill my dog." The box has the quotation "One of the ten best films of the decade." I'm inclined to agree. This overlooked motion picture is dramatic, witty, thoughtful and full of excellent performances. Image Transfer Review: The black and white cinematography comes through crisply, with a certain amount of grain lending a documentary feel at times. The picture is gorgeous throughout; during the Nazi Germany sequences, the colors are rich and fully saturated, and in the later episodes in New York after the war, a cooler palette is used and comes through nicely. The anamorphic picture is clear, without significant artifacting. Blacks are rich and solid, and there is no evidence of smearing or oversaturation. A very good transfer. Audio Transfer Review: The main drawback to the disc is a somewhat lifeless audio; there is significant hiss throughout as well. The soundstage is very forward, with little use of the surrounds or LFE channel. Since much of the film is dialogue-driven, these aren't serious defects. Overall, an acceptable, but lackluster, audio track. Extras Review: It's not clear to me why New Line didn't label this jam-packed disc as one of their Platinum Series; it has as much content as many other releases that get that label. We start off with an excellent commentary from the director, Keith Gordon, and the screenwriter, Robert B. Weide, which is screen-specific and full of interesting observations and theory behind the camera movements and production design. A second commentary is edited from interviews with Nolte, and is not screen-specific, but is nonetheless interesting as well. In his wide-ranging talk, he covers the film, thoughts on acting, fame and its seductions, Nazism, the significance of the Nuremberg trials, biochemistry and more. Seven deleted scenes are included, and can be played both with and without commentary from Gordon. These scenes were mostly cut from the film for running time purposes, but do fill in a few blanks. They unfortunately aren't subtitled, which is one of the few failings of this package of extras. Fairly complete filmographies are included for Gordon, Weide, Nolte, Lee, Arkin and Goodman, and a bibliography for Vonnegut. Extras keep coming, as we get several minutes of newsreel footage from the 1961 trial of Adolf Eichmann in Israel. We get a 12 minute interview segment with Vonnegut himself and Nolte, which eventually becomes rather uncomfortable for all concerned. We are provided with multi-screen biographies for Adolf Hitler, Rudolf Hoess (commander of Auschwitz), Eichmann, Rudolf Hess (who flew to Scotland, and not to be confused with Hoess), Joseph Goebbels, Hermann Goering and Heinrich Himmler. The brevity of these bios tends to minimize the monstrosity of this cast of characters; perhaps longer pieces would have demonstrated their personas a bit better. A red-band R trailer for the film is included, as are trailers for Simpatico (hidden in Nolte's filmography), and Twin Peaks: Fire Walk With Me (hidden in Lee's filmography). The latter truly whetted my appetite for seeing Twin Peaks on DVD. Finally, there is a first draft of the trailer, which is even more brutal than the final trailer that was used. A superb film, with excellent performances, in a splendid package of extras. Don't overlook this important film, given a terrific DVD release by New Line. Very highly recommended.